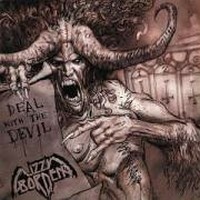 With Deal With The Devil the American band Lizzy Borden is returning. If the comeback will be successful, well that's up to the metal fans. Actually the cover artwork don't get me, I liked the old cover and the stuff Todd MacFarnlane did for Iced Earth, but this... Well, it fits the title.... Music is what matters, right? The opening track is called There Will Be Blood Tonight and it's a classic Lizzy Borden tune. If they keep the level, then it's a killer album! But first listen to the rest of the album. Another cool track is Zanzibar which has an oriental touch - another typical Lizzy Borden tune. But there are not just killers, there are fillers! Like We Only Come Out At Night which has a modern rhythm and so has a slight Rammstein influence - due to the beat. Not that the song is bad, but it doesn't fit to this band. With Generation Landslide they cover Alice Cooper... Hmm, they have visual effects like the original shock rocker, but their cover version don't have the charm of the original. But is a real highlight when you just listened to We Only Come Out At Night! The other songs are average to good and quite typical Lizzy Borden tunes. My resume... A decent album and if you find it for a few bucks, then get yourself a copy!